Michelle Bennett Oates was born and educated in London. At the age of eighteen she moved with her parents to Little Plumstead, near Norwich. There she trained as an artist with her late father Bennett Oates, who was an internationally renowned flower painter. In the first few years of her career she painted wildlife and exhibited regularly with the Tryon and Moorland Gallery in Cork Street, London. In 1983 Michelle was elected to the Society of Wildlife Artists founded by Sir Peter Scott. A few years ago Michelle decided to concentrate on still life paintings of flowers and fruit but often incorporates wildlife subjects in her compositions. She sold a number of her early flower paintings in Singapore. Michelle’s medium is oil on board, which is traditional with the Dutch School of flower painters. She prepares her boards carefully. First she lays down a layer of rabbit skin glue, then she gives each board two coats of primer. After rubbing the board down to give a smooth surface, she covers the whole board with a medium tone coating of oil paint to give a neutral ground to work on. 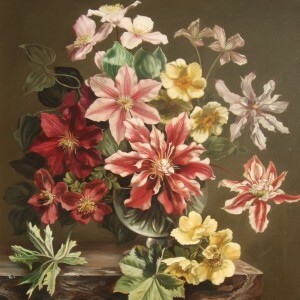 Still life painting, particularly the flower piece, is extremely demanding and requires great skill and extraordinary fluidity of technique . Each painting takes a few weeks to complete as Michelle builds up the flowers with thin layers of paint, scraping down each layer before applying the next. Michelle is married and lives near Tavistock on the edge of Dartmoor. She is a keen gardener and time not spent painting is spent in her three-acre garden where she grows many of the flowers which appear in her paintings.